Roughly 24 hours before the waiver trade deadline, the New York Yankees have added to their roster for the stretch run. Early Friday morning, the Yankees acquired outfielder Andrew McCutchen from the San Francisco Giants. The Giants have acquired minor league infielder Abiatal Avelino pitching prospect Juan De Paula as part of the deal. Both are among New York’s top-30 prospects, according to MLB.com. The acquisition of McCutchen is no doubt a response to Aaron Judge’s slow recovery from a broken wrist and the depth issues the Yankees have experienced in their outfield as a result. Judge was initially hurt at the end of July. At the time, he was given a three-week timeline to return, which seemed a little optimistic. More than a month later, Judge is still not able to swing a bat or throw a ball. The Yankees are still unclear on his return, even if Judge has said he’d be willing to return before the injury has fully healed. Since Judge has been out, journeyman Shane Robinson and infielder Neil Walker have been helping to fill the void in right field. Robinson is hitting .143 on the season, so he’s not provided any offensive help. Walker, meanwhile, has had an outstanding August with the bat. However, he’s not a natural outfielder. The absence of Judge has also made it harder to get Giancarlo Stanton rest, as he battles tightness in his hamstring. Stanton can get a break by serving as the DH. But that requires either Robinson or Walker to play right field. The acquisition of McCutchen should provide instant relief to New York’s outfield. McCutchen served as San Francisco’s everyday right fielder this season, so he should fill that same role with the Yankees until Judge returns. That could allow Stanton to serve as the DH everytime he’s in the lineup. Of course, the former MVP could also be used to spell both Brett Gardner and Aaron Hicks at the other outfield spots. McCutchen is no longer playing at an MVP level. However, he’s still hitting .255 with an OPS of .772 this season, so he’s still a productive major league hitter. He’s also a fine defensive player who brings some playoff experience to the table. When Judge returns, the addition of McCutchen ensures the Yankees will have at least four quality outfielders, five if you include Stanton, giving them plenty of depth and versatility. The only caveat to this trade is that it could be too little too late. The Yankees are 8.5 games behind the Red Sox in the AL East race. Had they made a move for McCutchen or another outfielder soon after Judge went down, it may have helped them stay within striking distance of Boston. 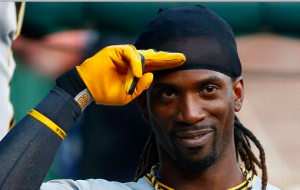 Nevertheless, McCutchen is a nice addition for the Yankees with the postseason on the horizon.